Imagine living in a world where everything is decided for you; what you eat, where you live, when you die, who you love. The officials who run Cassia’s society leave nothing up to choice. It makes for a more equal and controlled world. A “better” world. Matched, by Ally Condie, is the first novel in the Matched trilogy. The novel is a dystopian Young Adult novel about a tightly-controlled society in which young people are “matched” with their life partners at the age of 17. The main character, seventeen-year-old Cassia Reyes, is matched with her best friend Xander Carrow. However, when viewing the information for her Match, the picture of another young man appears on the screen; Ky Markham. The Officials never make mistakes, yet somehow, she’s been Matched with two boys. After being assured by someone in the Matching Department that it was, in fact, a mistake, Cassia tries to move on. But she can’t deny the new feelings she has for Ky, which seem to grow stronger with each day. As Cassia attempts to figure out the source of this mishap, she finds herself conflicted about whether her Match is appropriate for her – and whether the Society is all that it seems to be. Matched has an engaging, riveting plot that puts a modern spin on Romeo & Juliet. Girls will love the forbidden romance; boys will love the ever-present danger. 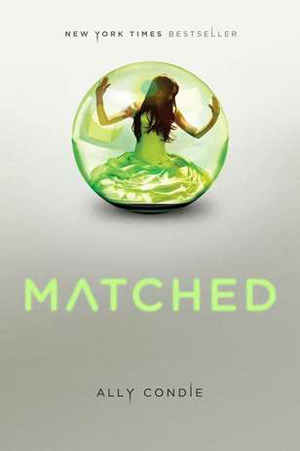 I would definitely recommend Matched by Ally Condie.